Before you hop to any conclusions, this cake is amazingly flavorful and not in any manner beetrooty! Consider carrot cake: eating a slice of that doesn't make you consider carrots; rather they add another layer to the surface and flavor, taking the cake to another level, without obviously overpowering it. 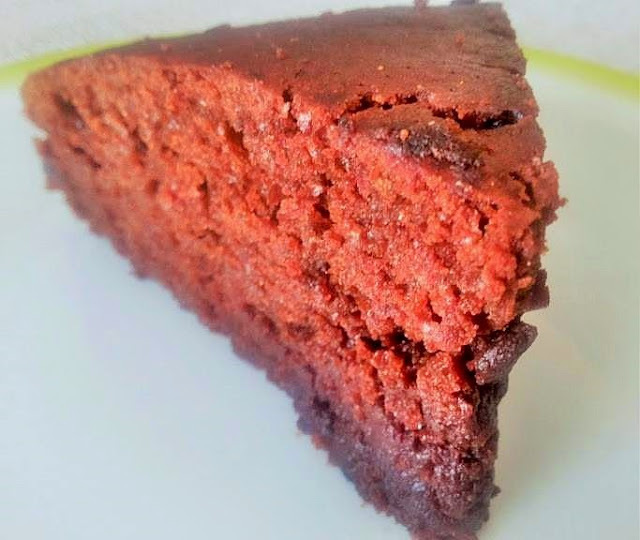 While beetroots are very versatile, I must admit that I would have never considered using them in a cake.Utilizing beetroot as a part of this recipe gives a heartiness that would somehow be missing in a plain chocolate cake. Fresh beetroots need a half hour to cook. Of course you can buy them precooked but avoid buying the jarred kind as these are pickled and wouldn't be terribly palatable with chocolate! The color is outstanding here and there wasn't even the smallest drop of food coloring in sight. Give this one a go. You will not be disappointed. 1. Preheat the oven to 180C/350F. Grease a 20 cm/8 inch round cake tin with a little butter and line the base with baking parchment. Chop the beetroot into small pieces and then blend in a food processor to create a purée. 3. Cut the butter into small pieces. Add them to the melting chocolate and leave to soften. Remove from the heat and allow to cool slightly. Meanwhile, sift the flour, baking powder and cocoa together in a bowl and set aside. 4. Separate the eggs. Whisk the egg yolks in a bowl until frothy. Stir the yolks into the chocolate and butter mixture and then fold in the beetroot. 5. Whisk the egg whites until they form stiff peaks. Fold in the sugar. 6. Fold the sugar and egg whites into the chocolate mixture, then fold in the flour and cocoa mixture. 7.Pour the mix into the prepared tin and bake for 40 minutes, or until a skewer inserted into the cake comes out clean. 8. Serve with a dollop of crème fraîche or vanilla ice cream.